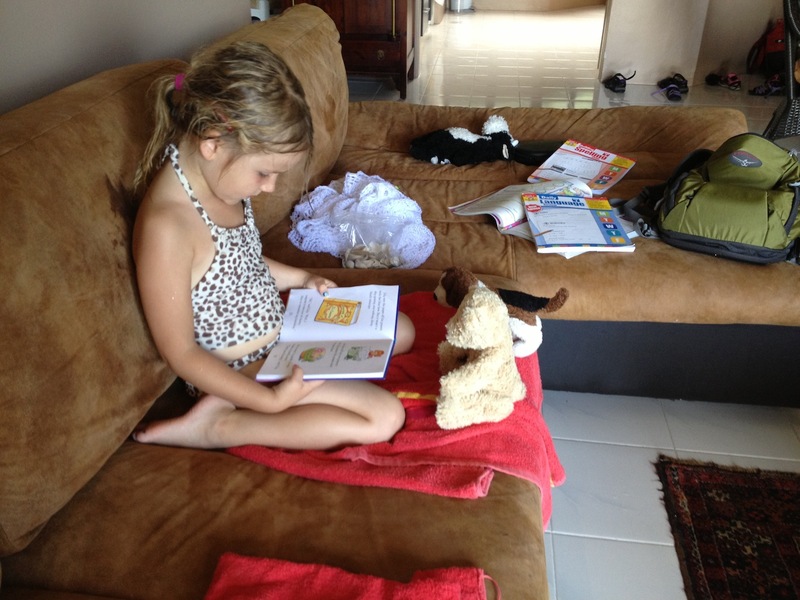 Zara laughingly exclaimed this morning that we should call it naked schooling, because she now can attend “school” wearing only underwear. One of the (I expect many) unanticipated advantages of our year of road schooling and a tropical climate. So what does it look like just a few days into this experiment? Early reviews are positive (from both “teacher” and “student”, although some days I’d be hard-pressed to identify which is which). We now start each day with 5 minutes of family meditation. I feared that even 5 minutes would prove challenge for our non-stop chatterbox, but we were surprised to learn that she is an old hand at meditation having done it regularly at school. So whereas I’m finding my mind straying even during these initial mini-meditation sessions, Zara has proclaimed that we should be able to do it for two hours by year-end. We follow the meditation with approximately an hour of math problems, spelling and some language arts and then the formal part of “school” is done for the day. Gym is yoga and swimming. 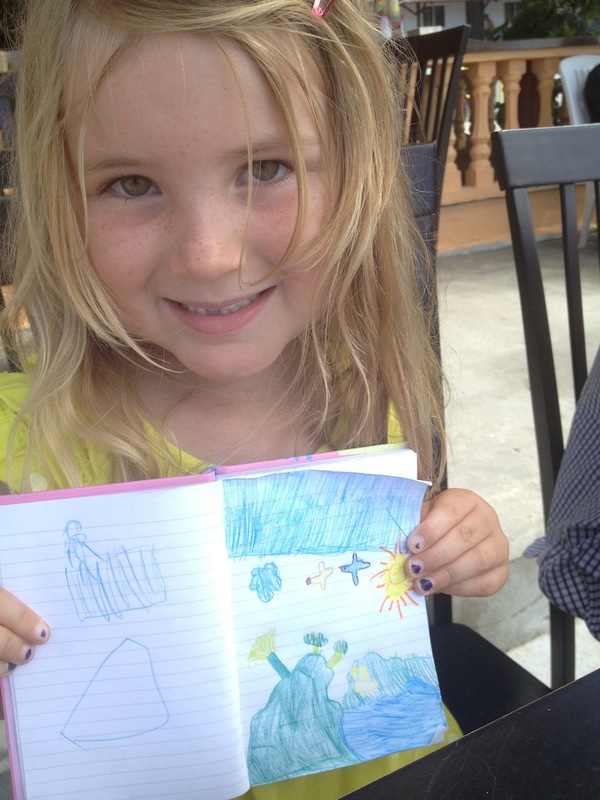 She keeps a journal (most days) and yesterday, science was collecting shells at the beach and art involved drawing a picture of the ocean view from a beachside cafe. To my giddy delight (being a bookworm married to an even bigger bookworm) is that Zara suddenly seems to have her nose in a book and likes to update us on her page count regularly. She insists that I pack several of her books wherever we go and last night on the way to the local hawkers market for dinner, I heard Jonathan admonishing Zara to not walk and read at the same time or she would trip. I had to suppress a smile. We found you! I’ve been looking! 🙂 So great to meet you the other day. Are you still here? How can I contact you? Hi! Yes–we are here until the 25th. My email is jennykirk@gmail.com. Would be great to get together!